Features for costing, billing and invoicing, time and expense tracking, resource allocation, and activity monitoring make it easier for project-based businesses to successfully initiate, plan, schedule, and execute their most important projects. We are renowned consultants offering Civil Engineering Services for variety civil engineering project with more than 26 years of rich experience, under the belt in Civil Engineering including Design, Construction & Project Monitoring in India & Abroad. Our shrewd and clever suggestions guide the clients to adopt strategies that are most viable to achieve desirable results. The work performance information from scope, schedule, and cost has actual measurements, such as the dollar amounts spent, the deliverables actually completed, and so forth. Cost and schedule forecasts are also used when assessing the overall project performance. Financial position of the construction project where the value of work executed is compared to the loan drawn-downs to-date. Audit on the cost required to complete the project. Viability appraisal of the anticipated total construction cost and proposed bank loan commitment and payback period. Assisted by our affluent industry indulgent and proficiency in this arena, we are able to provide Project Monitoring Services. Provided services are imparted by adroit personnel who hold vast knowledge in their respective realm that assists them in imparting these services in a well-organized way. raised. Tight integration with project inventory. 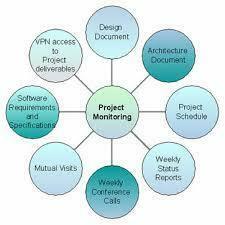 - monitoring of project for cost, time and quality vis-a-vis budget Quality Rating Services. Qualcon Engineering Solutions Pvt. Ltd.